Click chemistry consists in synthezing chemicals via the assembly of smaller modular units. 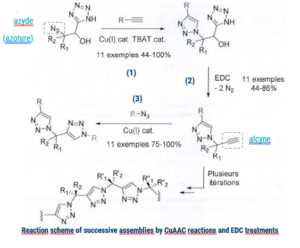 The invention relates more precisely to the CuAAC reaction ; copper(I)-catalysed azide-alkyne cycloaddition. The invention lies in the use of new compounds (alpha-hydroxy-beta tetrazoles) in click chemistry, allowing two ligations thanks to two successive CuAAC reactions. The first ligation is made with molecule (1), then the alpha-hydroxy-tetrazole group is transformed into an alkyne by EDC (a water-soluble crosslinker) treatment. The second alkyne, called latent alkyne (2), is used for a second CuAAC reaction (3), allowing the addition of a second molecule. The second alkyne being latent (not in the form of an alkyne during the first ligation) allows the grafting of a different molecule on the latter. This process can be seen as an orthogonal use of click chemistry.